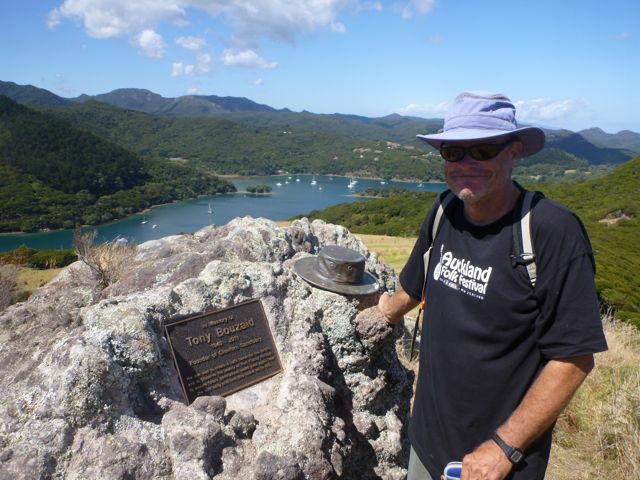 Sockdolager is in Port Fitzroy at Great Barrier Island, NZ. We’ve been volunteering our time at the Glenfern Sanctuary for almost two weeks. 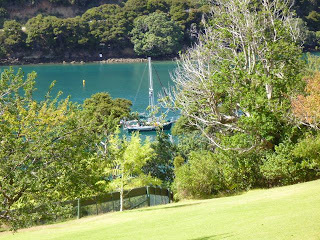 A view of the anchorage at Port Fitzroy from the mountain. 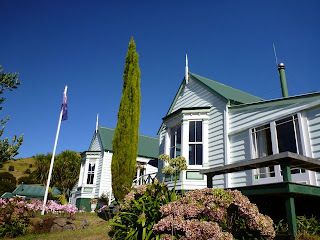 Glenfern is a rare place; more on it below. 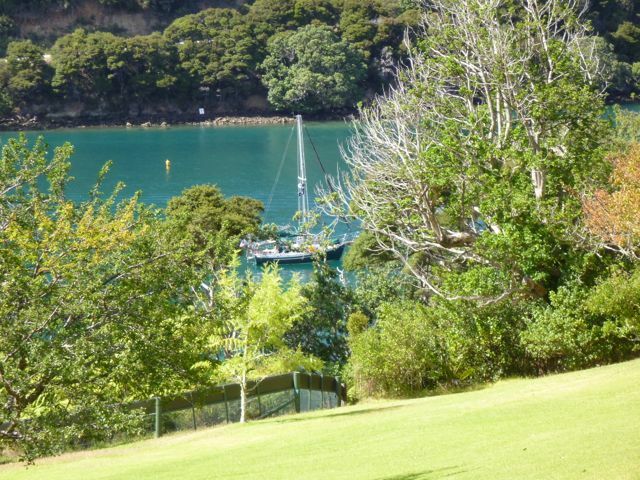 Scott and Emma, the managers of Glenfern, also sail this storied old beauty named Ruakuri. Non-sailor: Wait… you sailed a 24-foot boat from Seattle to New Zealand? Us: Actually, we left from Port Townsend, but yes. Non-sailor: You’re so brave! Weren’t you scared? How was it out there? There are lots of ways this kind of thing could be construed. Some family members, who have evidently been holding their breaths for several years, let out a collective sigh of relief once they learned we are heading home. Although most have been supportive and kind, one mentioned being glad that I have finally “come to my senses.” Does coming to one’s senses mean that a living dream should be put in past tense? Absolutely not. The dream will go on. Then there’s the responsibility angle. Are people who go cruising around in boats selfish or indulgent? 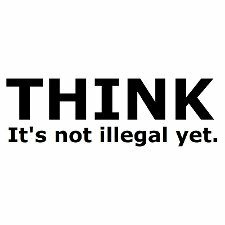 You know the world is so full of problems, some say, so why aren’t all you cruising people back home somewhere, working your butts off like the rest of us and being useful? Um, well, aren’t dreams useful in a life? Why dream if you can’t work toward living it? Dreaming is good; to live a dream is one of the best things any human being can aspire to. 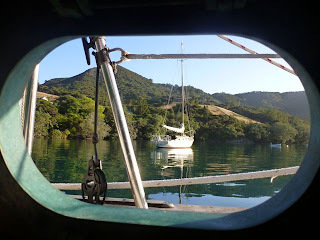 Sailing our Dana 24 across the Pacific to New Zealand is the dream we set out to live, but now that we’ve done it and brought you along with us vicariously, well, on reflection it does seem like a blind stab at optimism in a half-crazed world, doesn’t it. And the part about forgetting yourself isn’t so much forgetting yourself as forgetting the relative size of yourself, seeing your true place in the context of a big, still-beautiful world with an awful lot of decent people in it. That’s how I’d interpret coming to one’s senses. Sort of a feeling that perhaps enlightenment really means a shared intimacy with all living things. 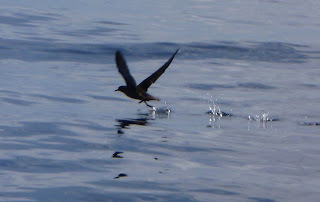 On the way to Great Barrier Island, we saw seabirds in huge variety. It makes such a difference to have a bird guide along, or other critter guides, so you can read about the animals you encounter. 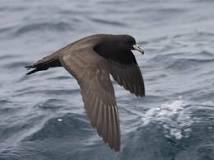 For example, I would not have guessed upon seeing a black petrel that there are only 1300 breeding pairs left in the world, that the entire lot nests on Little Barrier Island (with a few now coming to Glenfern,) that they drink salt water and snort the salt crystals out their “tube noses,” that they can live to 29 years, and that in winter they fly all the way from New Zealand to South America—how amazing is that! They are New Zealand’s most endangered seabird. 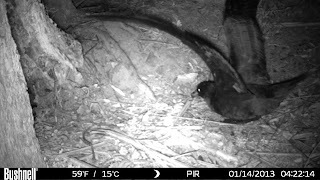 Here’s a black petrel chick in its burrow, way up the mountain at Glenfern. And here is a night camera snapping an image of a black petrel as it enters the burrow to feed its chick. Below is an Australasian gannet. These guys are heavy-bodied but good fliers, and when they plunge into the water after a fish you can hear it across the harbor. 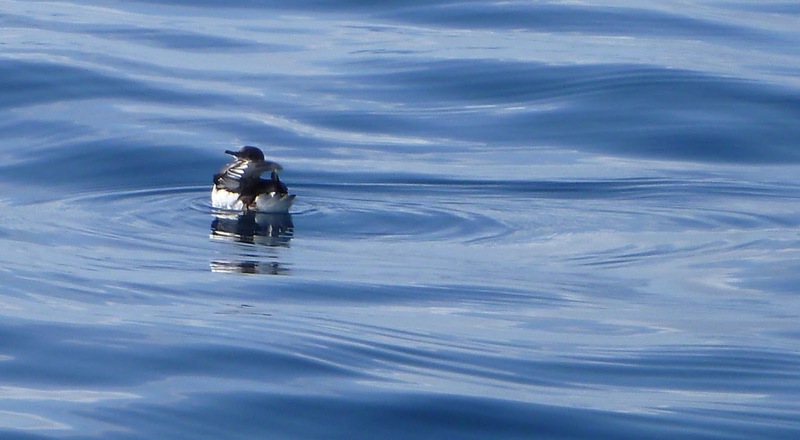 Here’s a fluttering shearwater preening. Here’s one taking off. They use a lot of energy getting airborne. 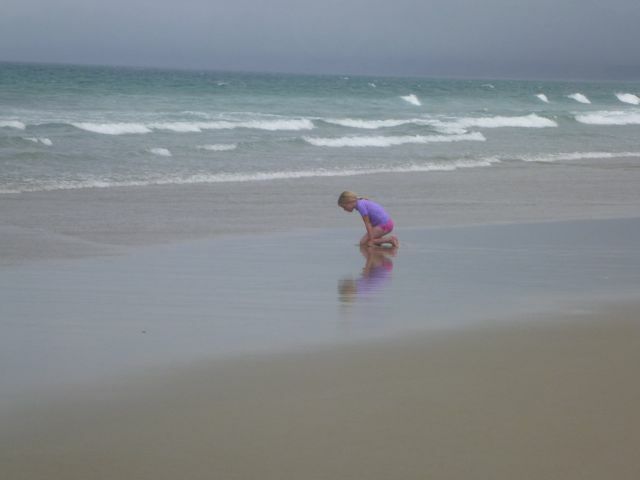 Finally, when they pull out of the water they often have to run across it if there’s not enough wind to get airborne right away, leaving "footprints." This bird is a sooty shearwater. A Magical Place: We’ve spent the last 2 weeks here, and want to share it with you. Glenfern Sanctuary, in Port Fitzroy on Great Barrier Island, is 240 hectares (about 600 acres) of privately-owned land, and is a fine example of what a wealthy person with dreams beyond status and more accumulation of wealth can give back to a community, a country, and the world. Yachtsman and businessman Tony Bouzaid bought this property and began restoring its native bush (forest and meadow) about 20 years ago, but he did a remarkable thing. 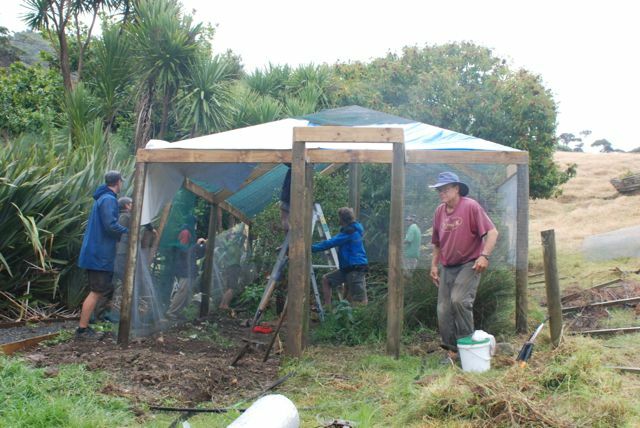 He and his staff convinced the other landowners and the community that a pest-proof fence across the entire Kotuku Peninsula, followed by intensive efforts to eradicate rats, would make a big difference in the ability of endangered wildlife to recover, and he was right. It’s worth noting that in New Zealand, except for bats and marine mammals there are no native terrestrial mammals; all were introduced. 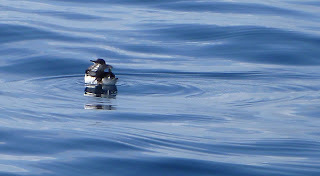 That’s part of why, especially on some islands, the bird diversity is so astounding. The pest-proof fence is 2 kilometers long and cost half a million dollars to build. What’s the big deal, you wonder? Have a look at this video to see what millions of rats do every night of the year, and then imagine the wildlife and birdsong we’d all have if this wasn’t happening. The differences on either side of Glenfern’s pest fence are dramatic. Inside it, where intensive rat control continues (because a few still swim to the unfenced portion from across the bay) you are surrounded by endangered birds that are able to nest and feed unmolested. 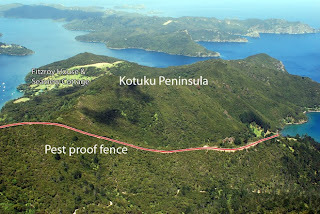 You can read the account of how this huge fence was built here. Feral cats and house cats have also been a problem. In the US, a recent scientific report details the toll taken on birds each year by pet house cats. 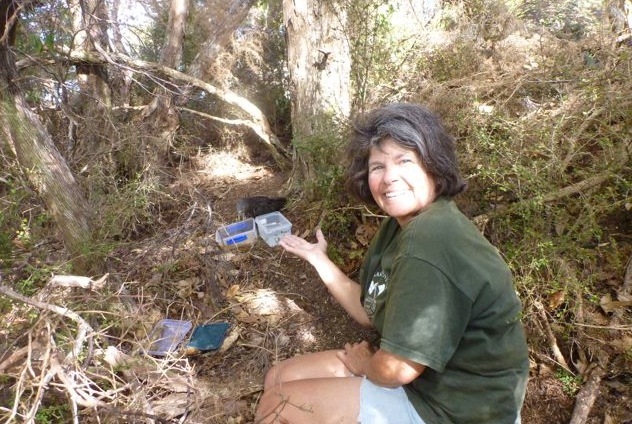 No one knows the toll from feral cats, but on islands where they exist, the air does not ring with birdsong. The numbers are staggering, more than a billion birds a year killed by house cats in the US alone. Anyone who doesn’t put a bell on their cat contributes to the loss. That’s why this pest-proof fence had to be so high, with a big flange at the top. Let’s have some fun. 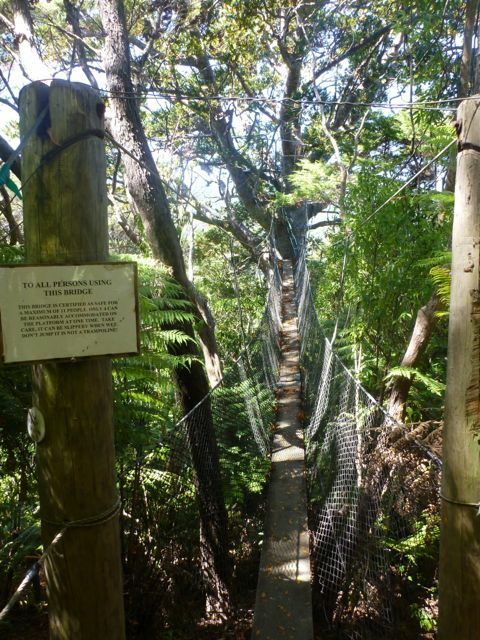 Take a walk on the wild side, with us up the mountain. 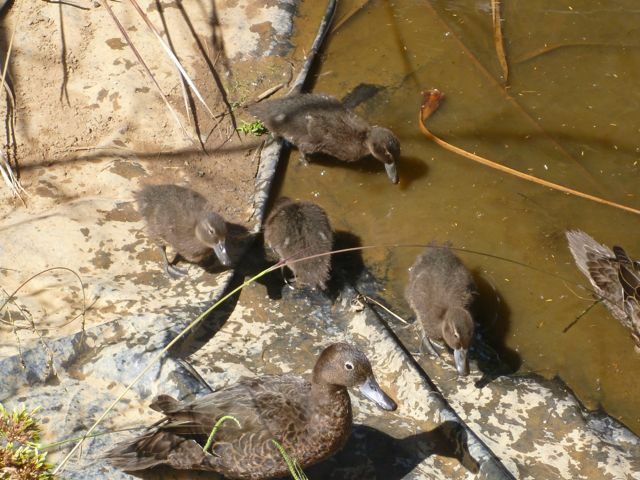 First we'll see a duck pond with a family of Pateke (brown teal) thriving in it. Pateke are considered the most endangered waterfowl in New Zealand. Next is Sunset Rock, Tony Bouzaid’s favorite place. Sadly, Tony died in 2011, but Scott and Emma, the managers, are carrying on his work along with their enthusiastic 5 year-old daughter Pippa. The family had his hat bronzed, and it sits atop the rock as a memorial. You can cross a swing bridge into the crown of a 600 year-old Kauri tree, way up high, in a valley that has never been logged. The structures are tied around, not drilled or screwed into, the tree. 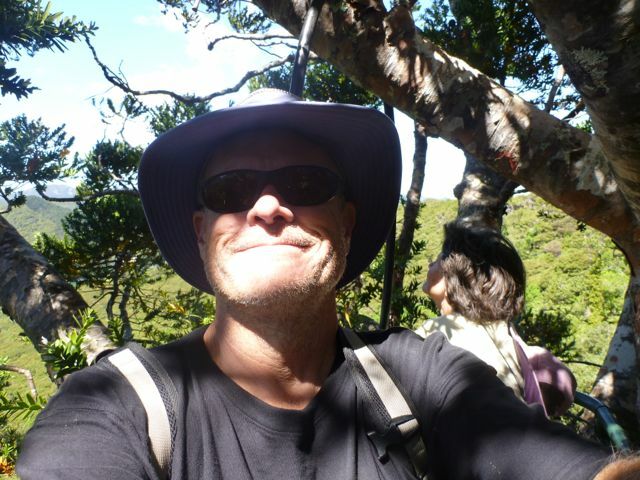 Once you’re way up in the canopy of that ancient Kauri tree, I dare you not to hug it. 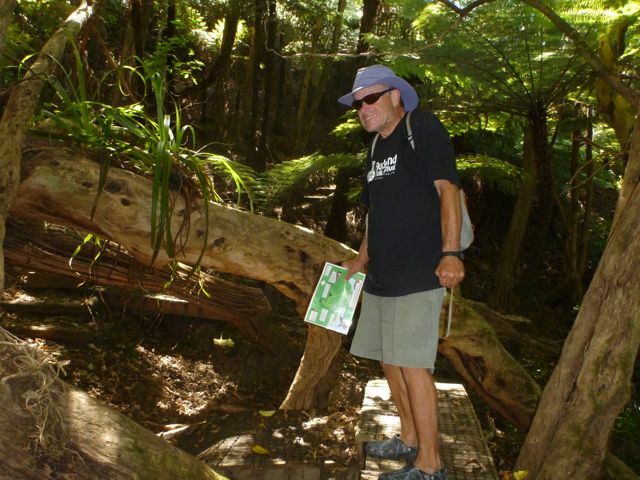 Not far from the Kauri is a big nest of Giant Weta Bugs. You know, the ones that weigh three times more than a mouse and eat carrots, and if you pick them up and stretch them out, their legs can span two feet. Check out the photo in this article. They will bite if you ask for it by picking them up (Scott, Glenfern's manager, has proven this over and over.) Like I’m going to follow suit and pick one up, ya sure yabetcha. To continue on the trail you have to duck under this log, which is full of Weta Bugs. Go fast. Later on, I was crawling around in so many Weta Bug nest areas trying to find petrel chicks that I decided to just not think about them. It’s not that I don’t like Wetas, I just prefer them with a little more distance. 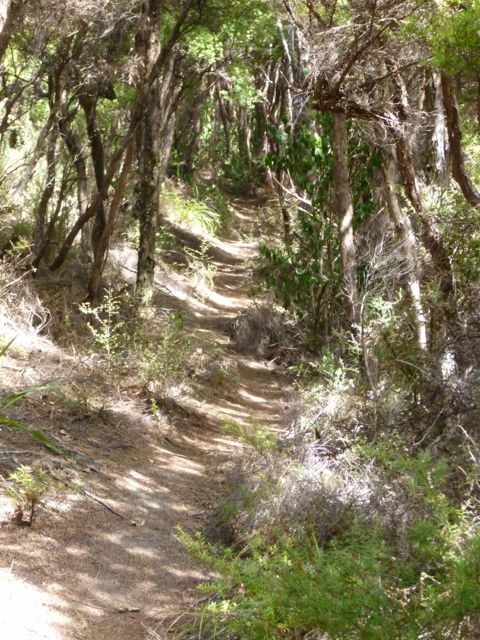 There is so much to see on the loop trail, which is about a mile. But come with us as volunteers and we’ll show you more. 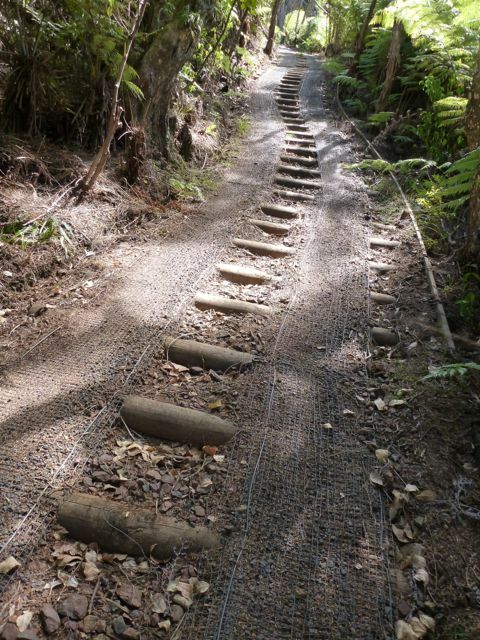 This is a quad track, off limits to visitors, but used by staff and volunteers. 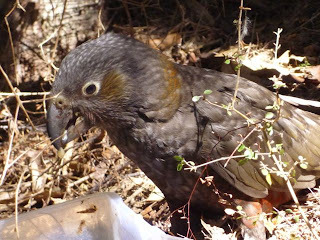 It leads steeply up to the ridgeline, where I was given the task of finding and feeding an abandoned baby wild parrot with the Maori species name of Kaka. Eventually I named it Sparky. Along the way you’ll see occasional tubular “rat tunnels” set out. 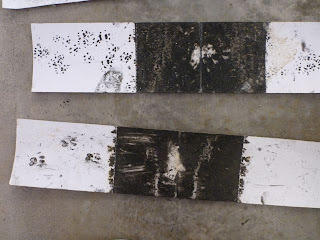 They're about 2 feet long and 5 inches high, and contain these inked and baited tracking strips below. The bait, a peanut butter mixture, contains an anticoagulant targeted at rats, and the ink gets on the feet of whatever goes in there. You can see the tracks. Whenever you see tiny dots and no rat prints, it means they’re Wetas, which is a good indicator of no rats in the area. 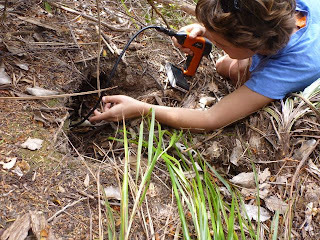 Patrolling and monitoring miles of bush transects laid with rat tunnels is part of the intensive pest control. One rat can destroy an entire year’s worth of chicks in burrows, so constant vigilance is necessary—and expensive. 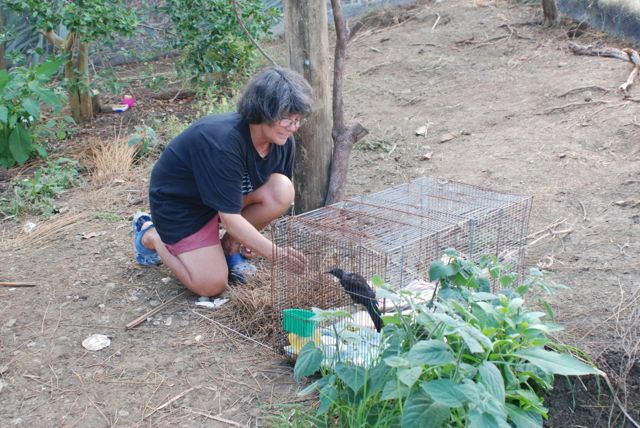 If the entire island was free of rats it would be much easier, and bird populations would rebound even more. If you go in one direction and scramble through steep overgrown forest with Dana Cook, a 24 year-old volunteer seabird biologist from Vancouver BC (and who will be looking for a biological job when she returns) you’d find nest burrows, some for black and others for Cooks petrels. 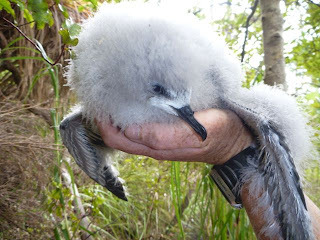 Dana is distantly related to Captain Cook, after whom the petrels are named, and we love the circularity of his descendant working to save these endangered birds. 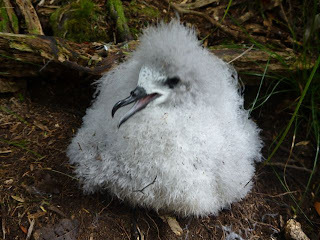 Here’s a photo of a Cook’s petrel chick. And another, during a weighing session where you can see its developing wings. No way they would survive in a rat-infested area. Here’s Dana operating a remote camera that bends around corners and is about five feet long. 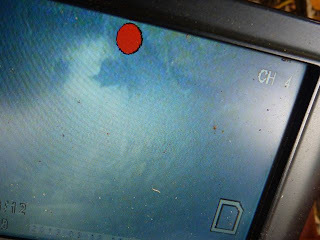 And here’s the image on the screen—success! A little Cooks petrel chick is in there, and the disturbance was minimal! We’re back at the ridgeline now, so let’s take you up a trail in the other direction (it’s pretty steep, be careful) to the top of the ridge, where the baby Kaka is. 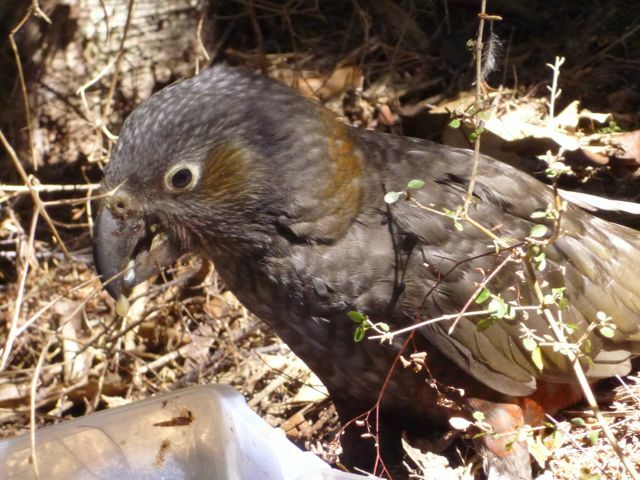 The little Kaka was weak and wobbly, perhaps not far from starving when we found it and began feeding it. This photo was taken with a telephoto setting. For awhile we fed it sugar water, but switched to a high protein mash-and-fruit diet, which it gobbled hungrily. But it needed two such meals a day if it was to make progress, and a big storm was coming, so one day Jim and I went up the mountain, gently put the Kaka in a padded box, and carefully brought it down to a holding cage next to the aviary that everyone was working at top speed to build. Here’s the work crew. At last the aviary was ready! 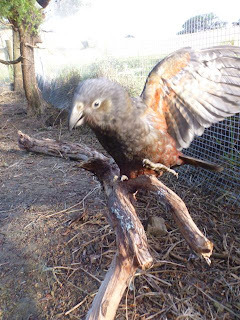 I had been taking care of two birds, the Kaka and also a Tui that is almost ready to be released back into the wild. 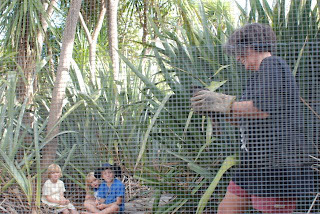 Time to release the Tui into the aviary, where it can practice flying and landing in the trees inside. The Tui joyfully took a bath and flew to the top of the tree, where it looked so happy it made us all laugh. Then it was the Kaka’s turn. I carried it from its holding cage into the aviary, and gave it some water and food. Parrots have sharp bills and it’s a good idea to wear leather gloves, though Sparky was pretty calm through the whole thing and didn’t try to bite me. I must admit that I felt humbly honored to be so entrusted with the care of these birds. The children are Pippa and two of three siblings from a visiting yacht whose parents were also volunteering their time. It wasn’t long before Sparky could climb up a low perch and try his wings. He/she is only 2 1/2 months old and has not learned to fly yet. 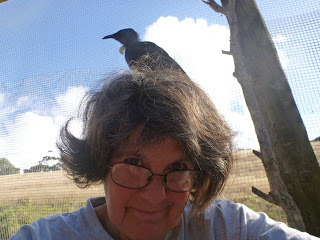 Sparky is now being expertly cared for at the Great Barrier Bird Rescue, and the Tui, named Milo, is awaiting a time later in the season when territorial behaviors of the dominant male Tui in the area stop. After that there will be no danger from that male, and Milo can be released. 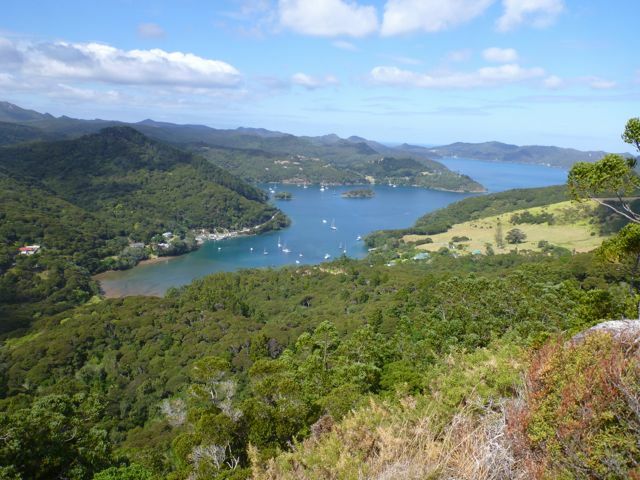 For more information about the ecology of Great Barrier Island, try visiting the Great Barrier Island Trust web site and read a few of its newsletters. Fruit trees on the property are bent over with their heavy late-season loads, and dozens of birds are gorging. 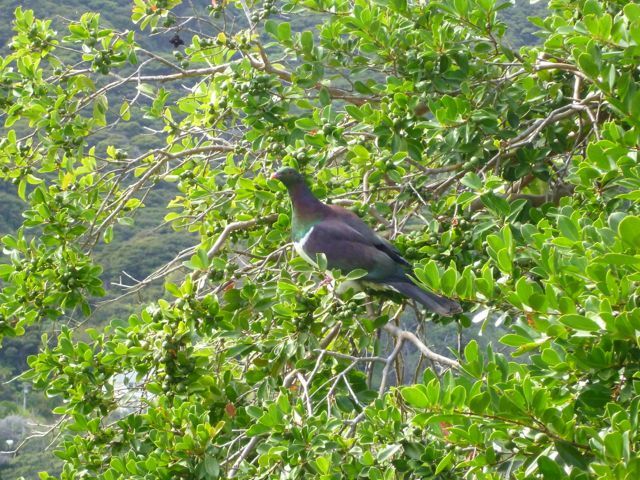 There are iridescent Kereru (NZ giant pigeon,) adult Kakas, white eyes and silvereyes, Tuis, several other species, and an exciting new visitor, the melodious Bellbird. We really meant it when we said we want to share all this with you. 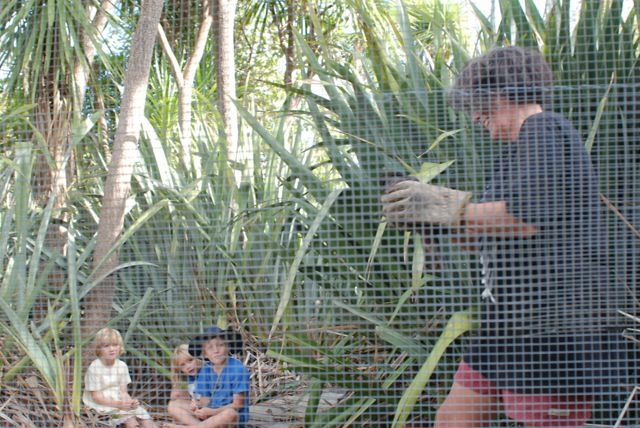 Glenfern Sanctuary needs volunteers, as its entire budget comes from grants (a shrinking resource in these cash-strapped days) and what private funds the Bouzaid family can give. If you’re interested in volunteering, go to Glenfern Sanctuary's web site and contact them. Volunteers are unpaid and you must provide your own food and transportation to Auckland, but the SeaLink Ferry to Great Barrier will pick up the cost of transporting volunteers out to the island. 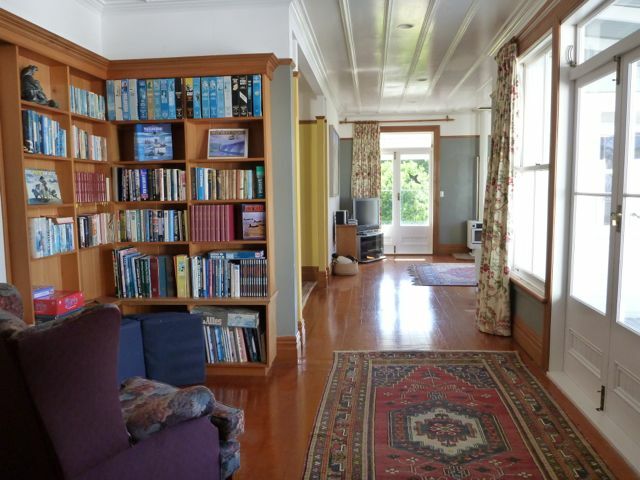 You can volunteer, or just stay in the 112 year-old, five-bedroom Fitzroy House, which is available to rent. Go to the Glenfern web site for details. Here’s the library and part of the living area. Or the three-bedroom, more modest Seaview Cottage is available to rent. Of course, these are for paying guests. 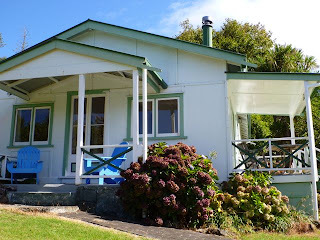 Volunteers are normally housed in less fancy quarters, at the former gallery that has been converted to a simple cottage. I just discovered your blog and I'm highly impressed. 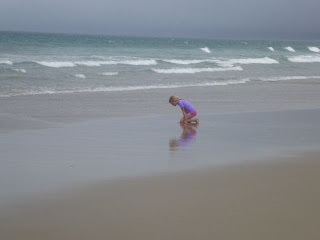 I am following your blog and I would like to invite you over to follow me back. I'm presently restoring a well neglected 21 foot Glen-L Fancy Free. It will be the subject of my posts, until I launch her, hopefully early this summer. I'm going to enjoy reading your adventures. Thanks for the compliment, and right backatcha on your eclectic, fun blog. It will be fun to see your restoration in progress, she's a lovely little ship. Good luck with it. Petrels rock! DH and I run a field station on an island in the Bay of Fundy, where we have 20-30 K nesting pairs of Leach's SPs. We love tube noses so much we named our boat (a PSC37) Fulmar. 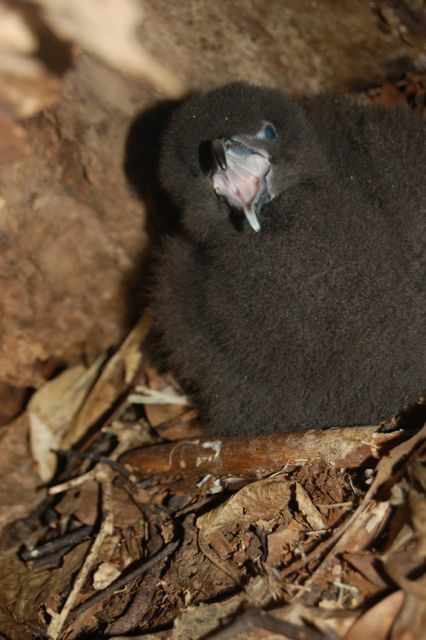 We thought about naming it petrel, but that sounds too much like petrol. Might confuse our Canadian neighbors. Excellent piece about introduced predators. Glad you got to do this, and if you ever come through the canal and up to the a Bay of Fundy, come on by Kent Island. We have a mooring waiting for you, but we'll make you grub some burrows to earn your keep! Thank you, Janet! 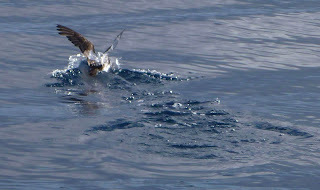 You are in petrel heaven up there. It would be fun to come for a visit, and grubbing burrows would be an absolute pleasure. Had to laugh at the petrel/petrol naming problem. We of course subscribe to the idea of naming one's boat something easy to pronounce and remember, like, uh... Sockdolager. Right. 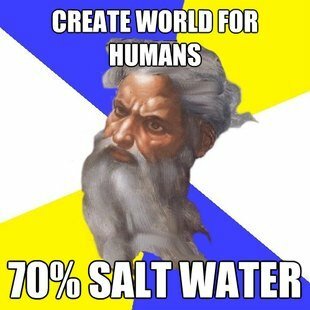 At least it's unique. That sounds like a fabulous cruising area.